The United Launch Alliance Atlas V rocket carrying NASA's Mars Science Laboratory (MSL) spacecraft, including the new rover, Curiosity, lifted off on time on the first opportunity at 10:02 a.m. EST on Nov. 26. ﻿ The mission will pioneer precision landing technology and a sky-crane touchdown to place Curiosity near the foot of a mountain inside Gale Crater on Aug. 6, 2012. During a nearly two-year prime mission after landing, the rover will investigate whether the region has ever offered conditions favorable for microbial life, including the chemical ingredients for life. "The launch vehicle has given us a great injection into our trajectory, and we're on our way to Mars," said Mars Science Laboratory Project Manager Peter Theisinger of NASA's Jet Propulsion Laboratory in Pasadena, Calif. "The spacecraft is in communication, thermally stable and power positive." An artist's concept of NASA's biggest-ever Mars rover Curiosity examining a rock on the Red Planet. The Atlas V initially lofted the spacecraft into Earth orbit and then, with a second burst from the vehicle's upper stage, pushed it out of Earth orbit into a 352-million-mile (567-million-kilometer) journey to Mars. "Our first trajectory correction maneuver will be in about two weeks," Theisinger said. "We'll do instrument checkouts in the next several weeks and continue with thorough preparations for the landing on Mars and operations on the surface." Curiosity's ambitious science goals are among the mission's many differences from earlier Mars rovers. It will use a drill and scoop at the end of its robotic arm to gather soil and powdered samples of rock interiors, then sieve and parcel out these samples into analytical laboratory instruments inside the rover. Curiosity carries 10 science instruments with a total mass 15 times as large as the science-instrument payloads on the Mars rovers Spirit and Opportunity. Some of the tools are the first of their kind on Mars, such as a laser-firing instrument for checking the elemental composition of rocks from a distance, and an X-ray diffraction instrument for definitive identification of minerals in powdered samples. To haul and wield its science payload, Curiosity is twice as long and five times as heavy as Spirit or Opportunity. Because of its one-ton mass, Curiosity is too heavy to employ airbags to cushion its landing as previous Mars rovers could. Part of the Mars Science Laboratory spacecraft is a rocket-powered descent stage that will lower the rover on tethers as the rocket engines control the speed of descent. The mission's landing site offers Curiosity access for driving to layers of the mountain inside Gale Crater. Observations from orbit have identified clay and sulfate minerals in the lower layers, indicating a wet history. Precision landing maneuvers as the spacecraft flies through the Martian atmosphere before opening its parachute make Gale a safe target for the first time. This innovation shrinks the target area to less than one-fourth the size of earlier Mars landing targets. Without it, rough terrain at the edges of Curiosity's target would make the site unacceptably hazardous. The innovations for landing a heavier spacecraft with greater precision are steps in technology development for human Mars missions. 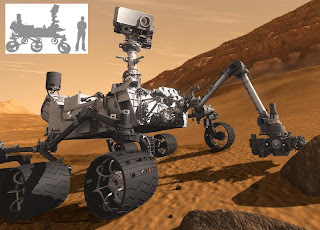 In addition, Curiosity carries an instrument for monitoring the natural radiation environment on Mars, important information for designing human Mars missions that protect astronauts' health.